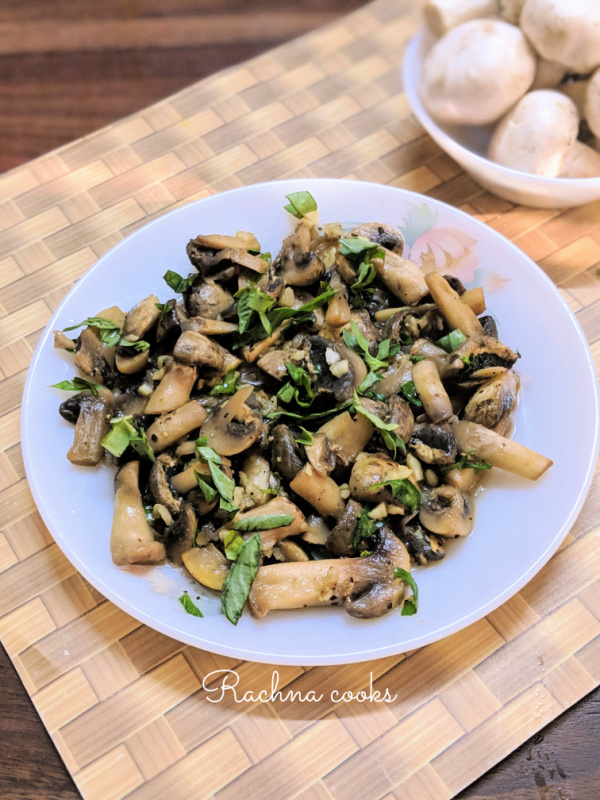 This is a super easy and quick mushroom stir fry recipe that is perfect for an evening snack with beer or just as an appetizer. It is wholesome and tasty. Heat olive oil in a pan. Add minced garlic and fry for 30 seconds. Add sliced mushroom along with fresh pepper, half of basil leaves and salt. Your mushroom will release water. Add red wine (if using) and cook on high heat for a minute. Take the mushroom out in a plate. You can cook the sauce some more say about 2-3 minutes after sprinkling lemon juice on it. Now spread the thickish sauce on the mushroom and serve hot garnished with remaining basil leaves. Your mushroom stir fry is ready to be eaten. Don't overcook the mushroom. They should stay juicy and plump. You can use dried basil or any other Italian herb of choice in case you don't have fresh basil at hand. Dill or rosemary are good too. I like to use a slosh of red wine when I am feeling indulgent but it is optional and no need to use if you don't like to use red wine in your cooking. You could do the same stir fry using other veggies like broccoli, zucchini etc. Just remember that they will require more cooking time. You could substitute olive oil with butter if you so desire.